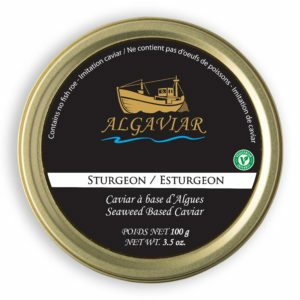 Sturgeon flavored Algaviar is a seaweed based caviar substitute manufactured by Quintessence Caviar since 2011. Algaviar is a very versatile product which can be used and consumed like caviar, as garnish or integrated as an ingredient in any food preparation. Unlike caviar, Algaviar will not break down when manipulated and has a pleasant jelly like texture. Algaviar is available in six different flavors. Sriracha flavored Algaviar is a seaweed based caviar substitute manufactured by Quintessence Caviar since 2011. Algaviar is a very versatile product which can be used and consumed like caviar, as garnish or integrated as an ingredient in any food preparation. Unlike caviar, Algaviar will not break down when manipulated and has a pleasant jelly like texture. Algaviar is available in six different flavors. 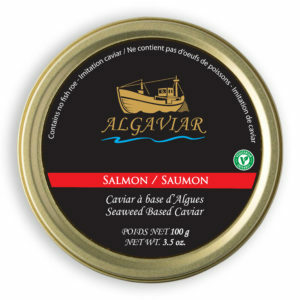 Salmon flavored Algaviar is a seaweed based caviar substitute manufactured by Quintessence Caviar since 2011. Algaviar is a very versatile product which can be used and consumed like caviar, as garnish or integrated as an ingredient in any food preparation. Unlike caviar, Algaviar will not break down when manipulated and has a pleasant jelly like texture. Algaviar is available in six different flavors. Wasabi flavored Algaviar is a seaweed based caviar substitute manufactured by Quintessence Caviar since 2011. Algaviar is a very versatile product which can be used and consumed like caviar, as garnish or integrated as an ingredient in any food preparation. Unlike caviar, Algaviar will not break down when manipulated and has a pleasant jelly like texture. Algaviar is available in six different flavors. Masago flavored Algaviar is a seaweed based caviar substitute manufactured by Quintessence Caviar since 2011. Algaviar is a very versatile product which can be used and consumed like caviar, as garnish or integrated as an ingredient in any food preparation. Unlike caviar, Algaviar will not break down when manipulated and has a pleasant jelly like texture. Algaviar is available in six different flavors. Balsamic flavored Algaviar is a seaweed based caviar substitute manufactured by Quintessence Caviar since 2011. Algaviar is a very versatile product which can be used and consumed like caviar, as garnish or integrated as an ingredient in any food preparation. Unlike caviar, Algaviar will not break down when manipulated and has a pleasant jelly like texture. Algaviar is available in six different flavors.